L to R: Wanda Hirth, Kristen Mathews and Brenda Seabourne with Bev and Colin Campbell in the Retreat Garden at Burpengarry. 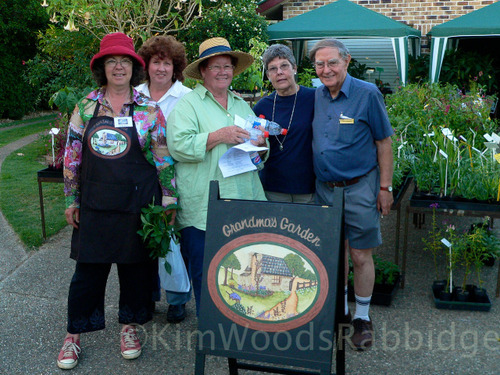 Colin helped promote gardens open to the public and if ever possible, he and Bev would drop in. Witty, warm hearted and wonderful – Colin Campbell, renown horticulturalist and media identity will be missed by everyone who met him, or listened on radio, or watched him on TV. Colin was amazingly generous with his time and advice, and even novices who asked him for the one thousandth time! (+-) how to care for lemons… or paw paws.. etc. were treated with genuine respect and patience. He had an insatiable thirst for knowledge and championed causes to create a better society. Bev, Colin’s wife and PA was his perfect partner: she’s good natured, well-organised, and just rolled with his mischievous antics. Mary Jo and I both used to chat to Colin on Saturday mornings on 4BC radio when we were Coordinators for Open Gardens Australia. Inevitably, we’d often leave the session chuckling over some politically incorrect or stirring observation of Colin’s… gosh he’ll be missed!